When Facebook first rolled out, the only brands that stood a chance to get those much-coveted likes were brands like Reeses or Nike. As “things you can like” turned into Facebook Pages, however, that changed. Now, businesses in both B2B and B2C industries can dominate on Facebook, even in some fields that aren’t quite as exciting from the customer’s perspective (hello, accounting firms!). I now recommend that almost all customer-facing businesses get on Facebook. That includes law firms and lawyers. It provides a central hub of marketing and a great way to connect with your audience while building your brand. Just as importantly, if you don’t, your competitors will, and you don’t want to let them beat you to it. 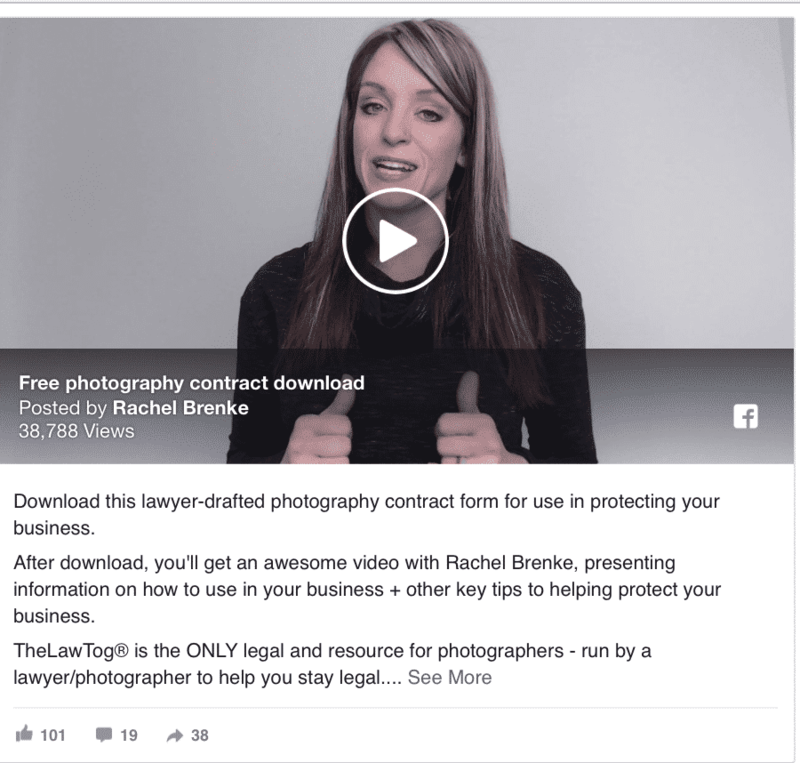 In this post, we’re going to go over everything you need to know about Facebook marketing for lawyers, including both organic marketing and how to run Facebook Ads. It’s easy to think that social media marketing and Facebook is just for restaurants and small fitness boutiques or apparel line, which are all businesses with enthusiastic communities and visual products. While they may have an easier time building a following and collecting engagement, that doesn’t mean that more “serious” businesses like law firms should skip the platform. Facebook has an exceptionally large and diverse user base. Even better this enormous user base is incredibly active on the platform, with more than 2.13 monthly active Facebook users and 1.4 billion daily active users. A chunk of these users happily use Facebook as a search engine when researching businesses in addition to or instead of Google. When some potential clients are using Facebook for research into firms and lawyers, you’ll be missing a huge opportunity to not be on the platform. This is a valuable potential first touch point you do not want to lose. 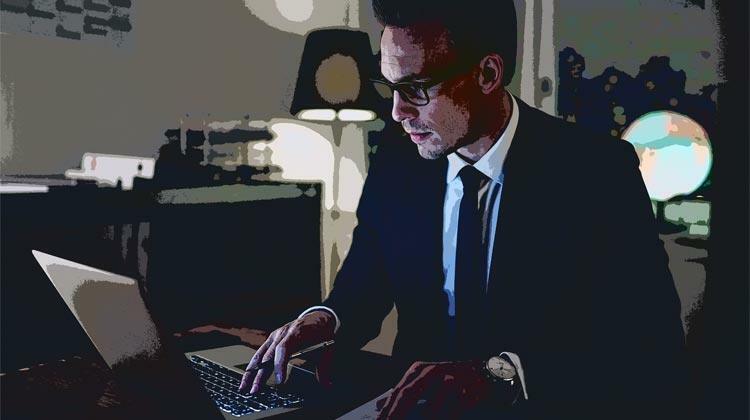 Even if they find you on Google, these users will likely be partial to firms they could find on social media, especially since lawyers aren’t overwhelmingly trusted in general and social media has an air of transparency. There are two key ways to get more clients and build relationships on Facebook: organic Facebook marketing and advertising with Facebook Ads. Organic Facebook marketing relies on you providing consistently valuable content to your target audience on your Page so that you can build a community there. It allows you to establish a long-standing social presence while setting up your Page to act as a funnel and send you more qualified leads. Having Facebook’s search engine-friendly content, so users will find you when they’re looking. Driving on-page engagement. After someone interacts with your content, a percentage of their followers may see the post and interaction in their own newsfeed. Increasing shares, both from other Pages and your followers. There are multiple organic Facebook marketing strategies that law firms and attorneys can use to accomplish all of these goals. Let’s take a look at the ones you should be using. Facebook’s Pages have come a long way since they were first created, and they’re now capable of being advanced marketing tools if you set them up correctly. 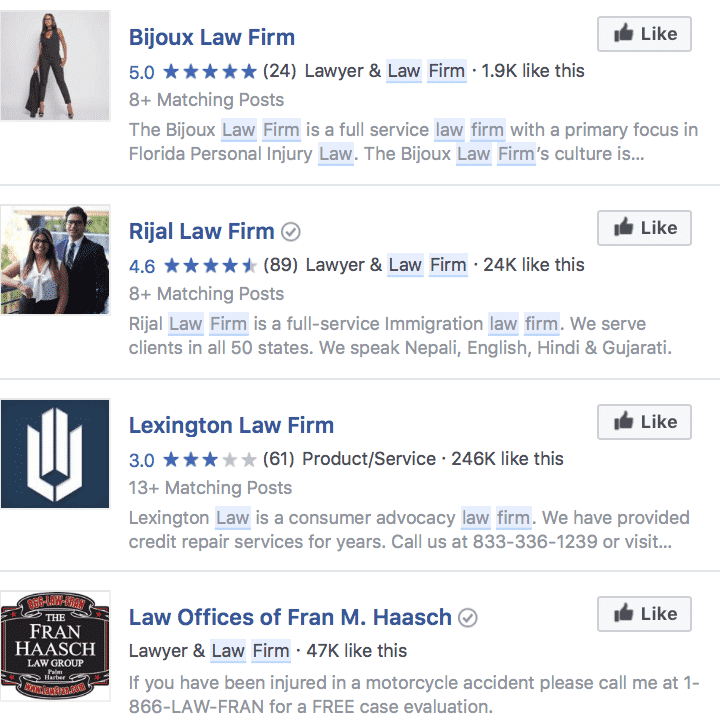 You can set up your Facebook Page to do a lot of different things, but the best strategy for law firms is to optimize it for lead generation. Utilize every opportunity to send potential leads to your site, to your inbox, and to convert. Listing your website in the “About Us” section; this is crucial, as without a site clearly listed, people will trust you less and they won’t bother looking for it. Choosing a lead-oriented CTA, like “Contact Us,” “Call Now,” or “Send Email.” People may shoot you a message through Messenger, but it’s best not to optimize for this specific action, as legal matters are often confidential and users may not feel comfortable sending sensitive information on Facebook. Choose a pinned post that quickly demonstrates your value, explains how you can help your clients, and contains an in-text CTA to call or get in touch. Many users won’t actually click to the “About Us” to read your full description, and it’s all about answering that “what’s in it for me?” questions users always have as soon as possible. Note that while you don’t want all (or even most) of your actual posts to contain CTAs meant to drive leads, you should include them occasionally in your mix of content. When it comes to marketing and building an online presence, there is one area lawyers struggle more than most other businesses: building trust. Many people are wary of trusting lawyers, and you need to get your clients to trust you with a lot of information and the outcome of potentially life-changing cases. A big part of your organic marketing should focus on strategies designed to build that trust, which will support your lead generation efforts in turn. FAQ: How can I adjust my status if I've overstayed? Using more video is one of the best ways to do that. It’s automatically easier for people to connect with someone they see talking, laughing, and smiling on video. They can see your body language and hear the tone of your voice, which they can’t do in a still photo. This allows them to start to develop trust and familiarity with you long before they get in touch. Keep it relatively short. Three minutes will often be the absolute maximum time you have to keep users watching, and two minutes or less will increase viewer retention rates. Don’t forget SEO. Make sure your description and video titles use common search phrases so you’ll increase the likelihood of showing up in search engines. Upload videos natively. Native videos are prioritized in the feed, significantly more so than outbound links. Upload your videos directly to Facebook instead of using a YouTube link. Cast your staff. In order to build trust, put your firm’s lawyers to be on camera instead of hiring actors or outsourcing. Let them explain their backgrounds, give legal advice, or answer questions. Videos should offer value in some form or another. We’ll look at how to do that next. Value is everything, especially for businesses that can’t woo customers with cakes made into the shape of unicorns. Most legal content won’t be inherently entertaining, but it can be exceptionally useful to your target audience. By sharing information and answering questions, you’re giving people information from a source they know they can trust while simultaneously demonstrating your own expertise at the same time. This is true even if you’re answering basic questions that seem obvious to you. If you have a blog, you’re likely using this strategy already. You can share some blog post links to your Facebook with an explanation of why users should read, but many of your posts shouldn’t necessarily have links to your site. Instead, Facebook typically rewards native content that doesn’t contain outbound links. 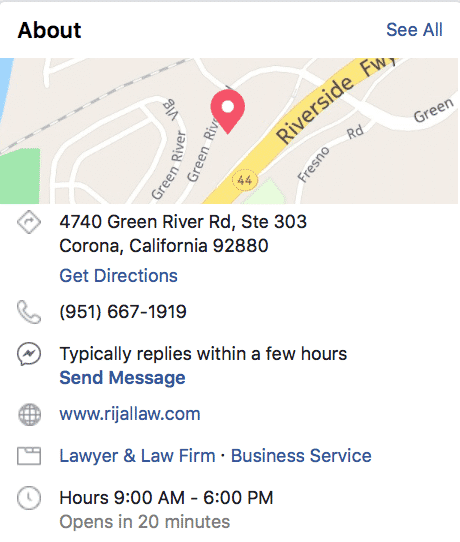 Law firms are one of the few businesses that I expect would get less private messages on Facebook than they do through their site just because of the secure nature of the work they do. That being said, never neglect your Page’s inbox for a second. People expect fast responses on live chat, and legal matters often are (or feel) extremely urgent to the people affected by them. Respond as quickly as you can, even if it’s just to ask them to contact you through phone or email directly. Reviews are one of the most valuable organic marketing tools you have available to you. 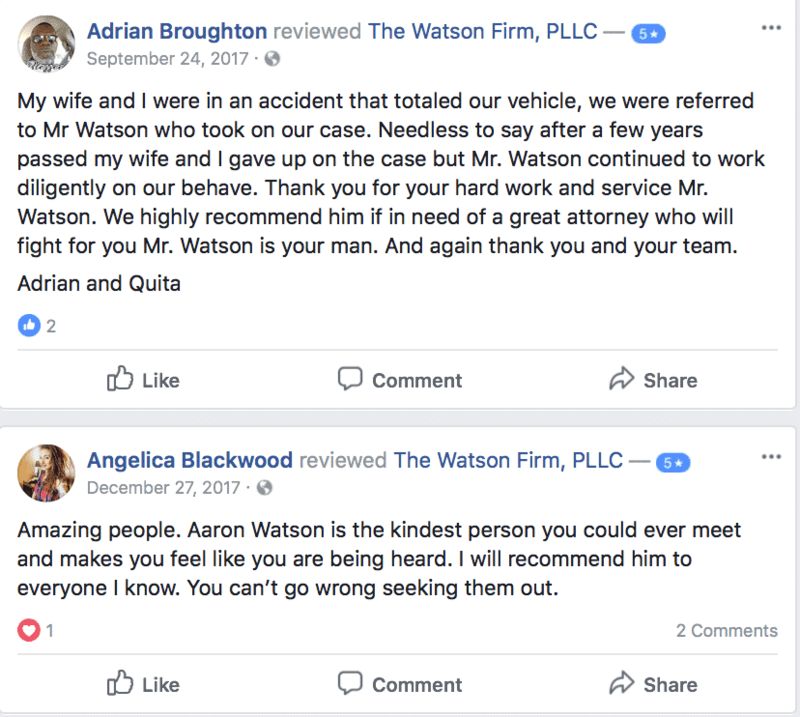 Even a few great reviews will help you stand out in the search engine and can help establish trust between you and potential clients. They’ll at least trust that you were able to help others in a similar situation, and it’s no secret that they’ll trust other clients more than they’ll trust you. Which firm are you most likely to contact? The ones with five stars, three stars, or none? Ask your clients to leave you reviews, either through email or a general call on Facebook. This is likely to be most effective, however, when you ask them one-on-one in person, and let them know that it really helps your business. Asking for a favor, sometimes, is all that’s needed to help you build up this very important part of your online presence. 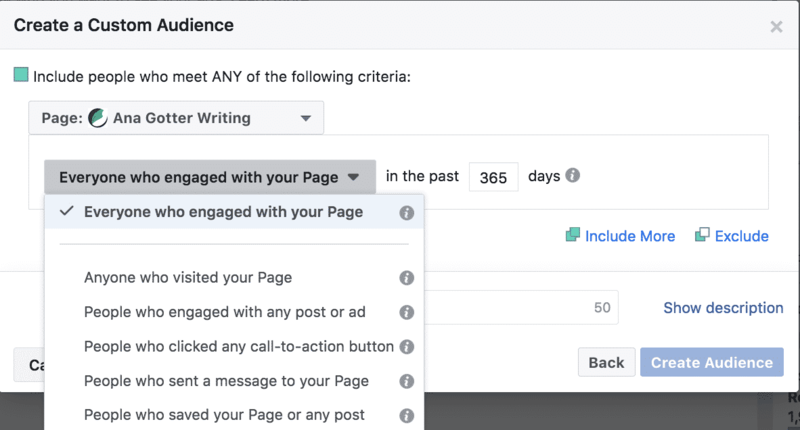 Once you’ve got your Facebook Page optimized and ready to go, you’re set to start running Facebook Ads. 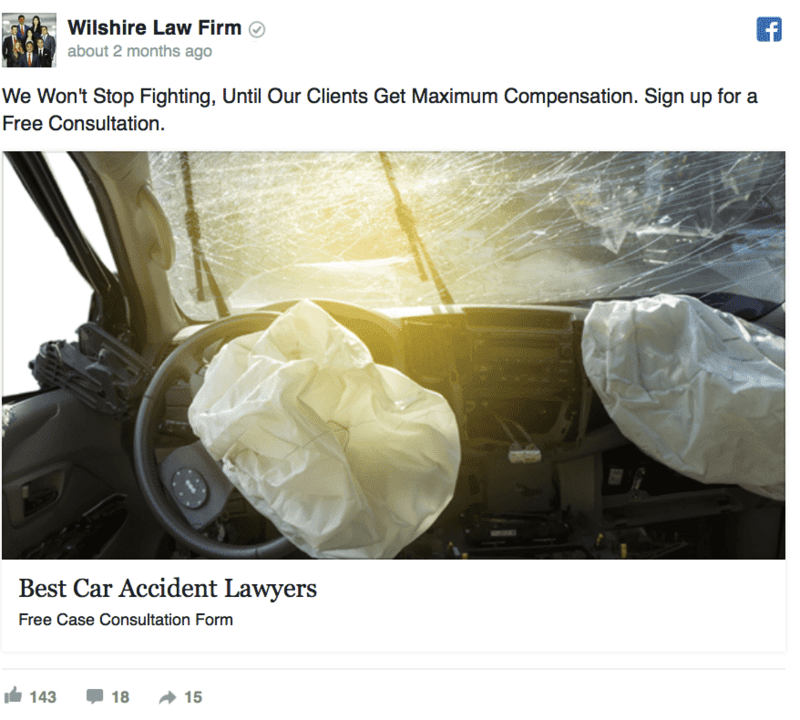 Facebook Ads will look a little different for law firms than other industries. A jeweler, for example, could safely show ads to married couples to try to increase watch or jewelry sales. A divorce attorney likely wouldn’t benefit from that same strategy and may instead upset a few happy couples. Because of this, nailing both the targeting and messaging up front are crucial. Your copy should cleanly explain what you do and what you can offer, but it should also be catered to the specific groups you’re targeting, even if you have to rewrite it for each campaign. If you’re in family law, going for the emotional appeal is effective. For personal injury law, a more aggressive approach with copy could benefit you, since personal relationships aren’t involved. You can also use offers like a free ebook combined with lead gen ads in order to slowly build relationships and capture lead information, instead of hoping that they click on the ad to come to you. This is particularly beneficial for industries where clients may not seek you out automatically, like in business law. 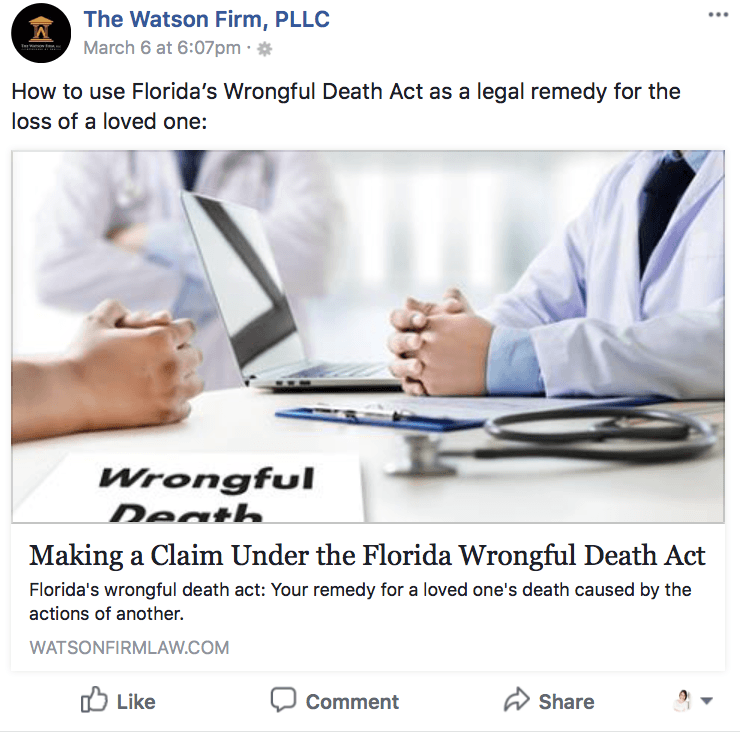 And when it comes to targeting, there are several strategies that I recommend most for law firms and attorneys on Facebook Ads. Running generalized campaigns that have only a city and no other criteria for targeting isn’t going to get you a lot of relevant placements as a law firm, because your clientele will fit into specific niches. Instead, you can utilize the following targeting strategies to connect with your target audience. Focus on retargeting, and very specific targeting criteria. These strategies will vary based on your exact firm and what you practice. Retargeting based off website activity. If people have checked out your site in the past thirty days, there’s a good chance they’re still in the research phases and looking into lawyers. (For some industries, this time frame may be significantly shorter, so take that into consideration). Create a custom audience based on website activity, and show ads to those users. Retargeting based off Facebook activity. Not only can you create audiences based on website activity, you can also do the same for Facebook activity. Create custom audiences off of users who have visited your Page, engaged with it, or saved posts. 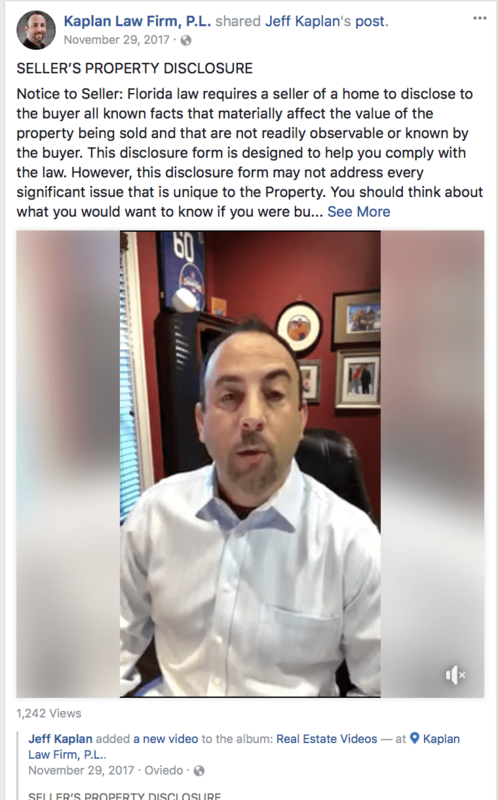 If someone saved a post about real estate law, after all, they probably need a real estate lawyer. Location. Law is often location-specific. It’s important to include city, zip code, or (at the very least) state targeting when running your ads. This will weed out irrelevant placements and clicks. Age. While Millennials will often ignore ads for estate planning, those who are older have possibly considered for themselves. It’s also possible they are actively trying to help aging parents with estate planning. Language. 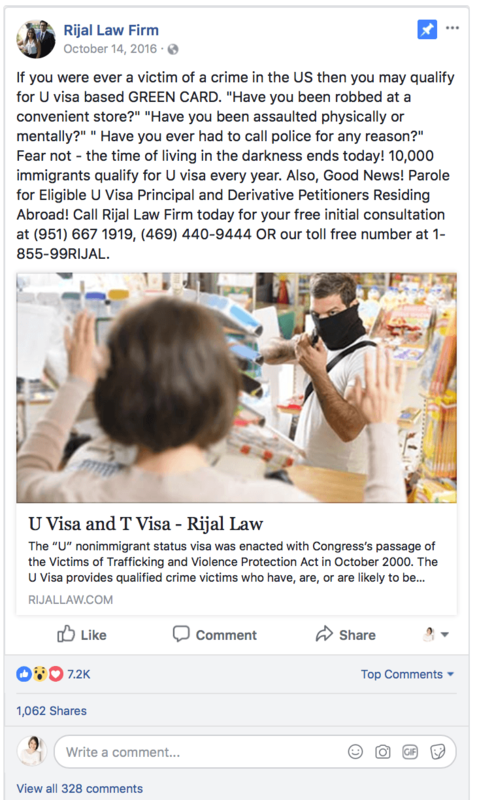 This one will likely be most effective for those in areas that are largely bilingual, like Florida, or for immigration attorneys. If you speak another language, you can run ad campaigns in them, targeting specific language speakers for each. Facebook marketing is often underutilized by many law firms. This will give you a distinct edge over your competition if you choose to be active on the platform. You should utilize organic Facebook marketing to develop strong relationships and a trustworthy, credible online presence. Then, use Facebook Ads to help push people further through the funnel. As always on social media, focus on providing value. Show potential clients what you can do for them and how you can help. Want some assistance running your Facebook Ad campaigns? We can help with that. Get in touch with us and see how we can help. What do you think? Do you use Facebook marketing for your law firm? Which strategies do you use? Share your thoughts and questions in the comments below! This article is very helpful it really helps me because I’m looking for that type of article so I really appreciate your article.